PRISMs to Power the UK. : Get ready to start giving up something if you want your oil energy - it may be your job! Get ready to start giving up something if you want your oil energy - it may be your job! We don't have it bad at all. If you had to pick anywhere in the world to earn your corn and live and save from the proceeds, most people would probably pick one of the EU-27 countries, the USA or Japan. But the EU-27, The USA and Japan have peaked - in oil energy terms - in 2004.But what does that mean? It means we're not willing to pay as much for oil as the rest of the world and so our demand has declined as the rest of the world's demand moves relentlessly upwards. THEIR NEED/GREED IS GREATER THAN OURS! If we want more energy from oil - and we all know that mainly means our cars and transport - we're going to have to pay more for it - AND FORGO SOMETHING ELSE! 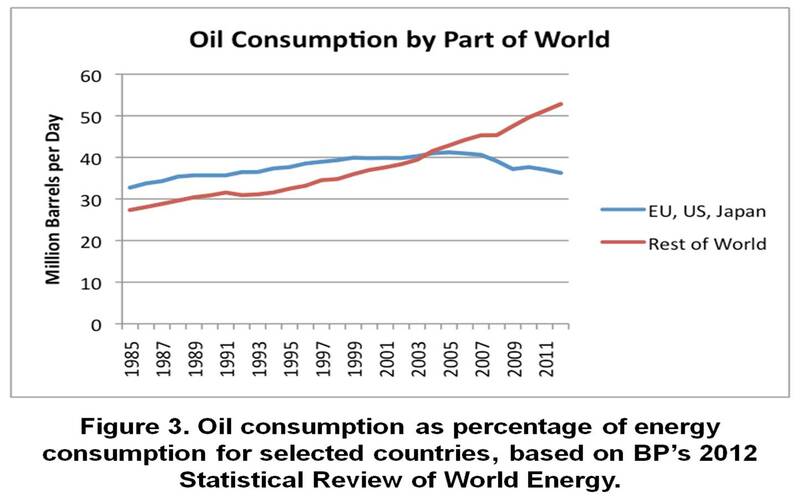 "...We in...the Euro-zone, [the United States] and Japan are already past peak oil demand. Oil demand has to do with how much oil we can afford. 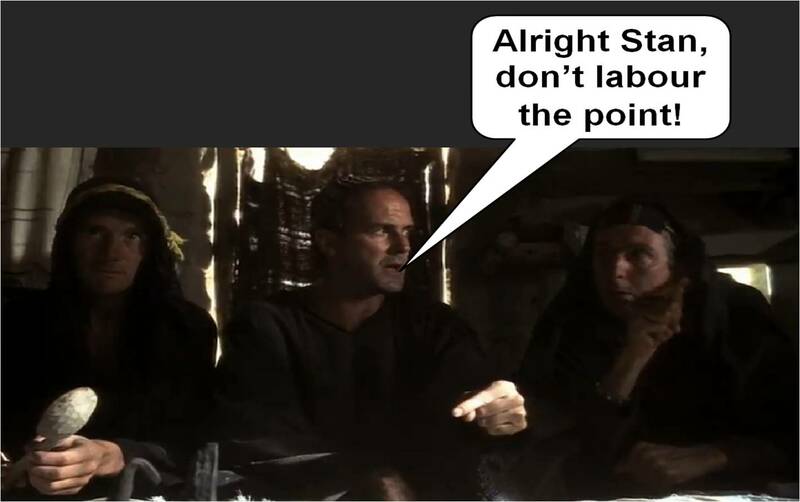 Many of the developed nations are not able to outbid the developing nations when it comes to the world’s limited oil supply. 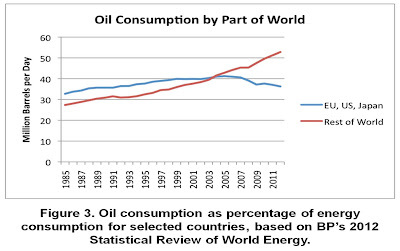 A chart of oil consumption shows that oil consumption peaked for the combination of the United States, EU-27, and Japan in 2005..."
"...Peak demand is very much related to jobs. Peak oil demand occurs when a country is not competitive in the world market-place, and because of this, loses industry and jobs. One reason this happens is because the country’s energy cost structure is not competitive in the world market-place. With the run-up in oil prices starting about 2003, oil is by far the most expensive of the traditional energy sources we have available today. Countries that use a large percentage of oil in their energy mix can be expected to have a hard time competing, because of oil’s higher cost..."